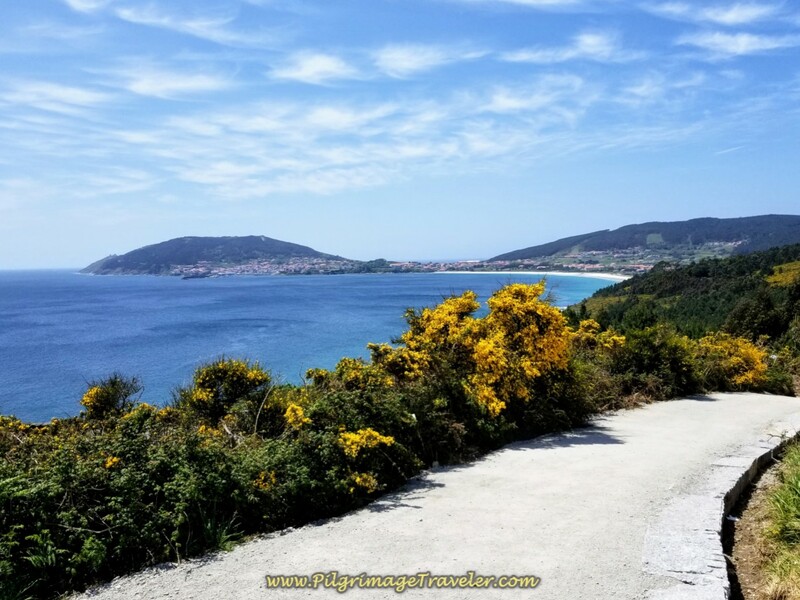 The end of your Camiño Fisterra journey is not the town of Finisterre but four more kilometers from the Baixar Cross to the Cape. If you made it here from Santiago in three days, another day may be needed to go the final distance to this medieval End of the World. 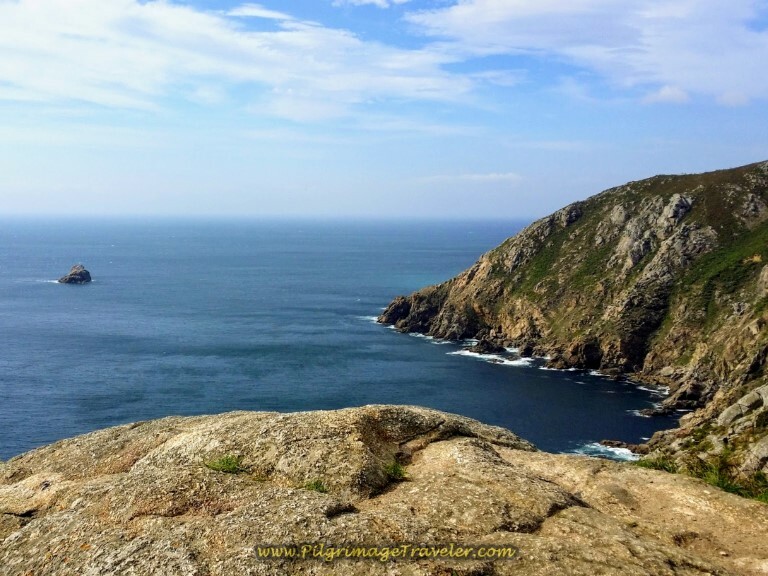 Finisterre, or Fisterra in Gallego, the local Galician dialect, means "Land's End" in Latin. 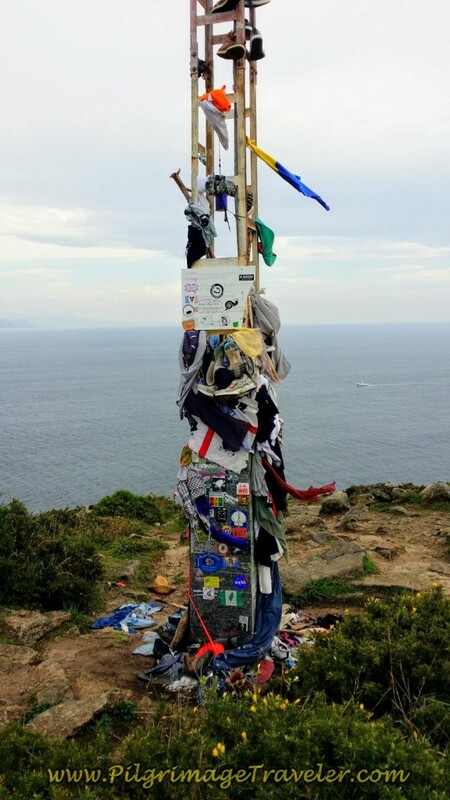 Indeed, for many pilgrims completing any Camino de Santiago, this Cape, or Cabo Fisterra, is their journey's end. 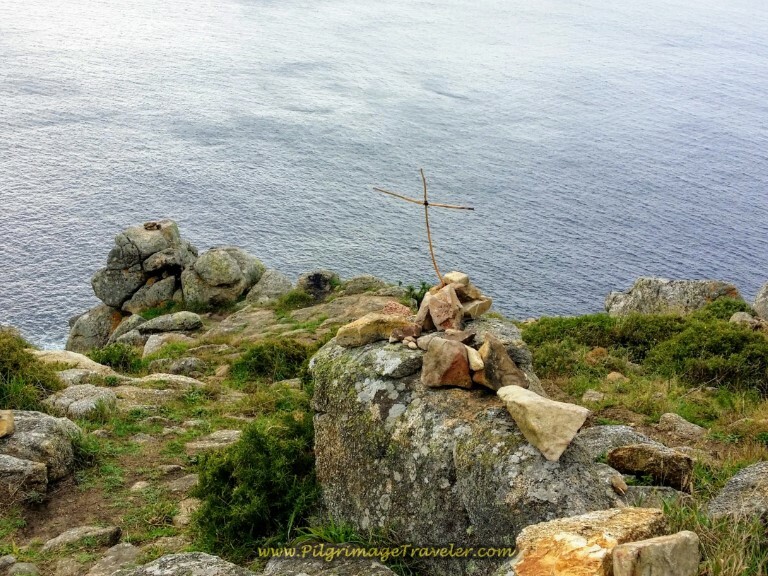 This coastal land is steeped in folklore, as you might care to read about in my introductory article on the Camino Finisterre. 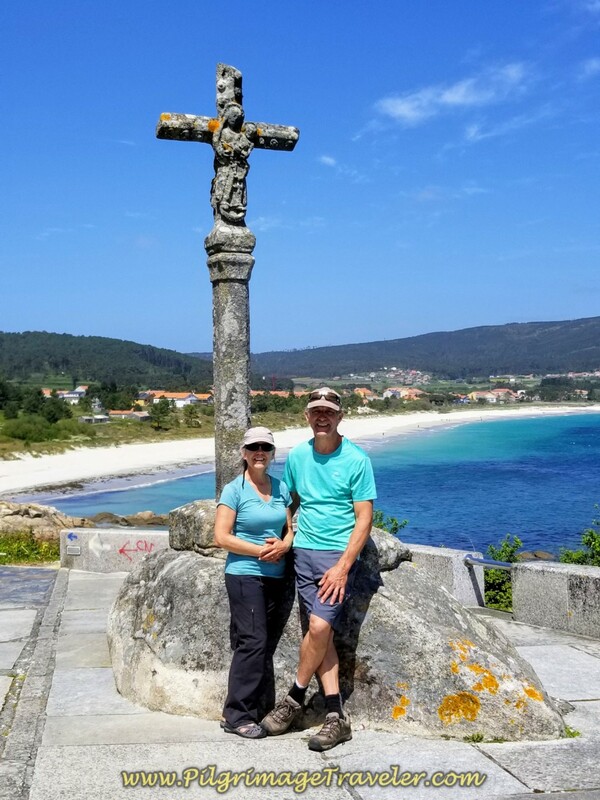 On your final approach to Finisterre on day three of the Camino Finisterre, you walk alongside the amazing and lengthy Langosteira Beach, shown in the photo below. The path is to the right in the photo below, on the other side of the grassy bank. It stays close to the shore as you approach town. From the sidewalk it goes up the hill to the cross called the Baixar Cross. You have officially arrived in the main part of town when you reach this cross, seen to the extreme left in the photo, that looks like a pole. If you are looking for a place to stay, there are many! Click here for a link to Booking.com to see them. I thank-you for booking through this website! 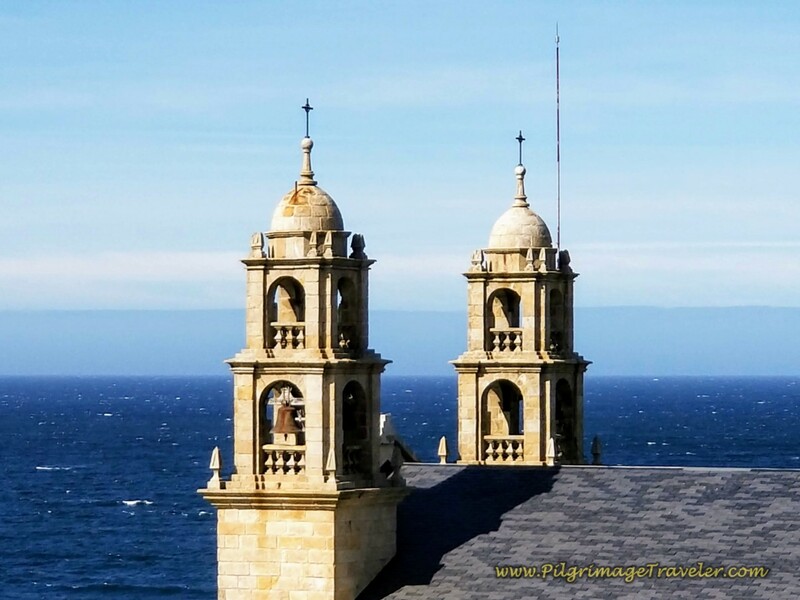 Most likely you will prefer a reservation in this popular town, because many tour buses arrive here from Santiago, bringing pilgrimage travelers of all types, not just walkers. If you are staying in an albergue, there is only one public municipal albergue, which I have placed on the map above. It is not possible to reserve in this 36-bed albergue, so arrive early if you plan to stay here. 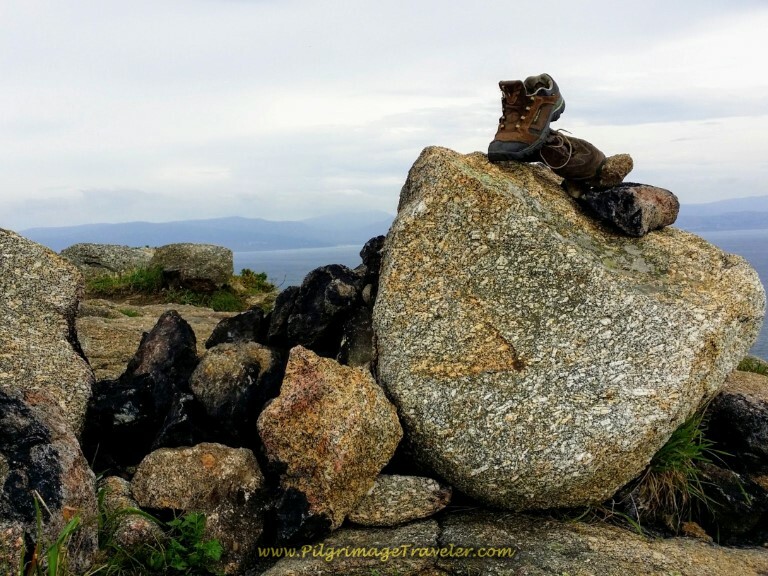 It is mere steps off the Camino. Some of the private albergues will also take reservations, and you can do so through the above link for most of them. 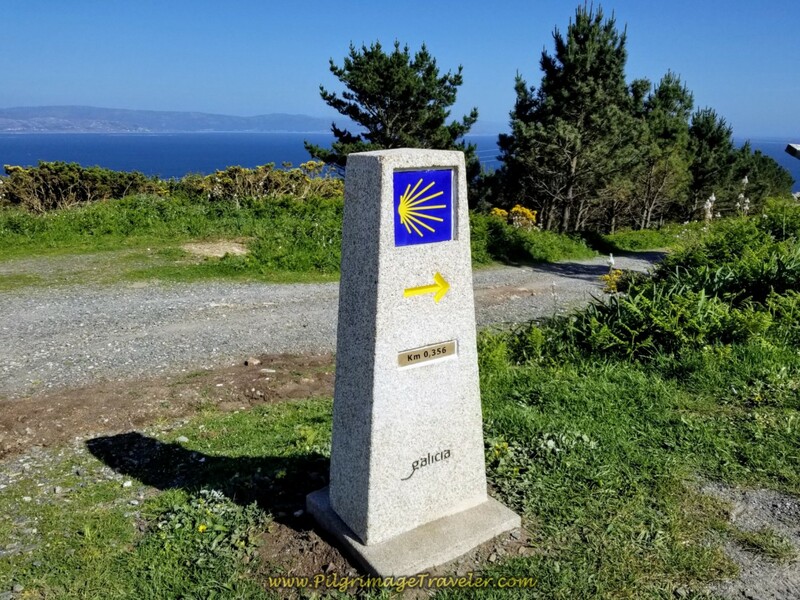 Here is our Google map, with our geotracks, that trace the route from the Baixar Cross to the 0.0 kilometer marker and the lighthouse on Cape Finisterre. As you can see from our elevation profile of these final four kilometers, it is not a walk in the park! This is especially true if you do not give yourself a break from your day three. It may feel like a forever walk to the Cape! Plus, unless you take a taxi, you must walk back, adding about 8 kilometers to day three, depending on where you are staying! For us, this made a whopping 39.6 kilometer day! The elevation gain is 202 meters (662 feet), not insignificant. I turned off my GPS at the 0.0 kilometer marker, so if you walk onward to the lighthouse and/or climb down the cliff, the distance is a bit more. From the Cross to the Cape at the 0.0 marker, it took us 2 hours and 18 minutes. 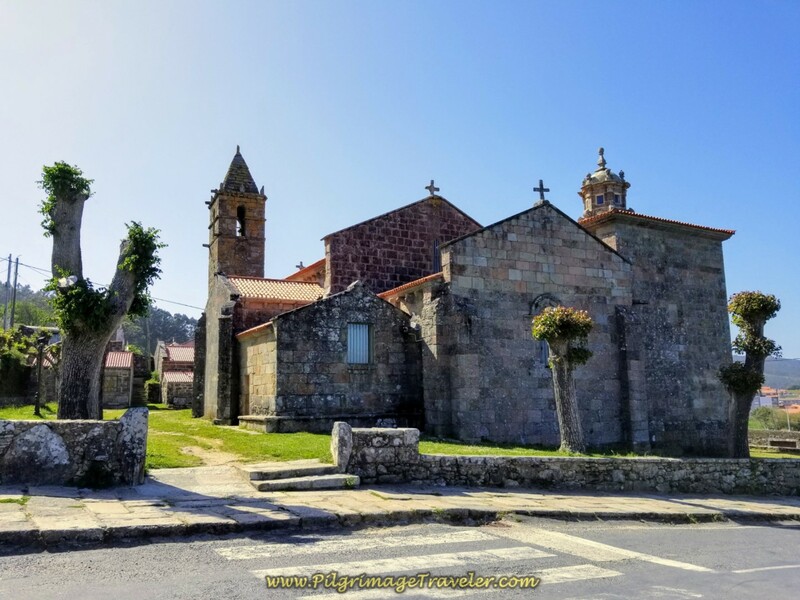 That was with lots of stops to admire the Costa da Morte and take lots of photos along the way! 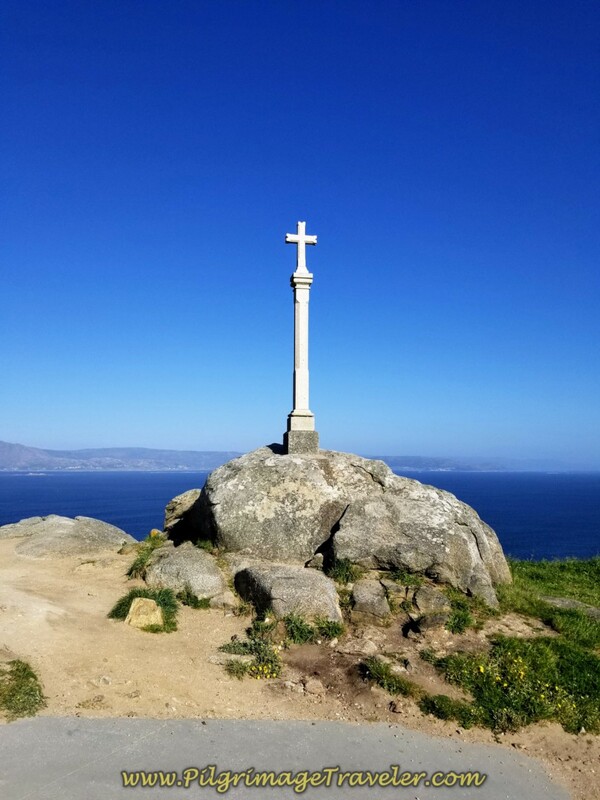 The start of the final four kilometers to Cape Finisterre, is of course, the famous Baixar Cross. Here we are below, tired but happy pilgrims as we arrived here on day three. It is at the cross that the lovely paved beach pathway joins our old friend, the AC-445. Continue on this motor road for about 300 meters, before it turns off to the right. This intersection is shown in the photo below. 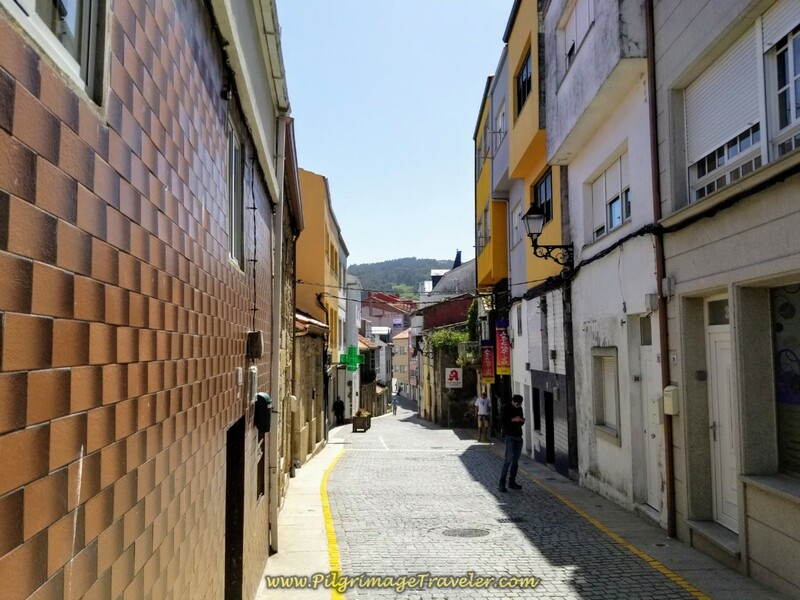 The street is also known as the Calle La Coruña. 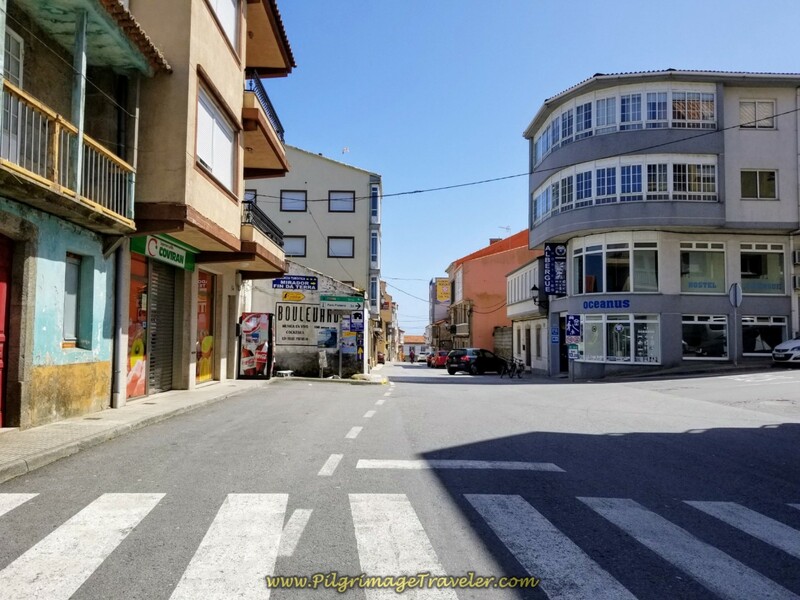 You can see the Coviran Supermarket on the left of the photo (it is closed) and the Albergue Oceanus on your right, on the corner. 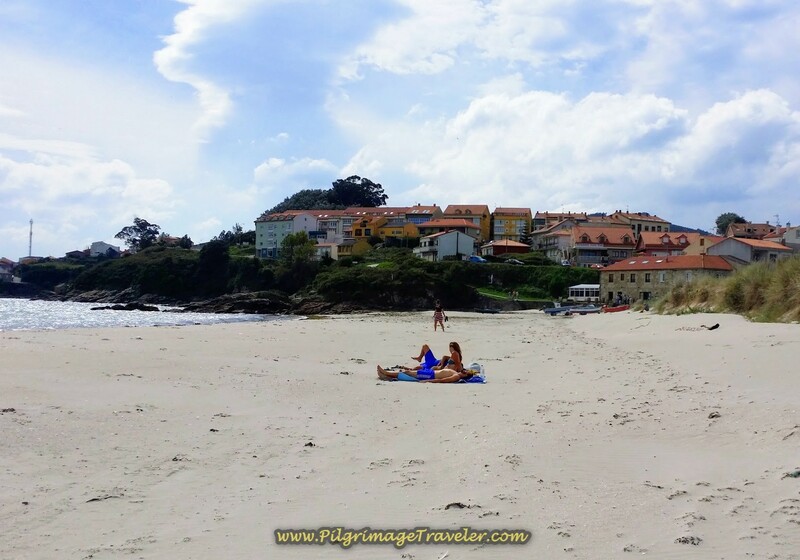 The Oceanus is one of the albergues that take reservations in Finisterre. The pilgrimage traveler keeps walking straight on here, to continue on the Calle La Coruña, until coming to a T-intersection in another 150 meters. 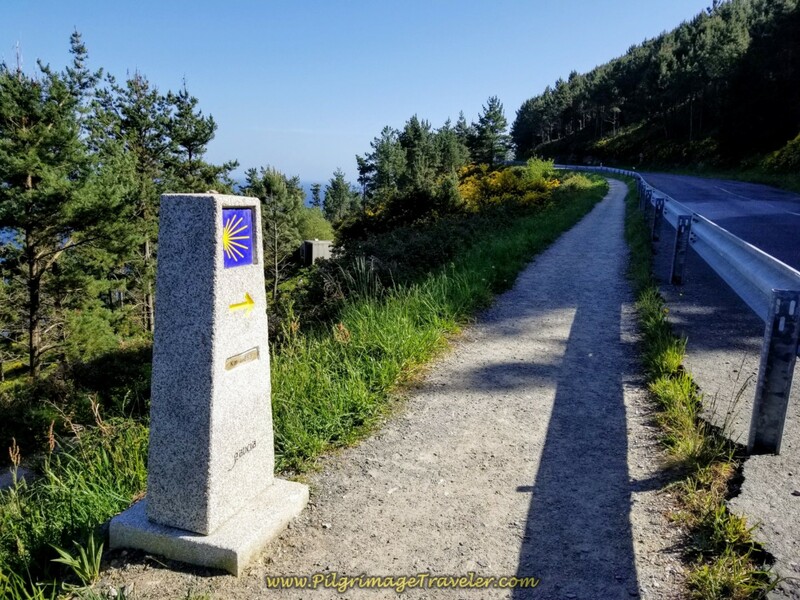 The Camino goes to the right and onto the Rúa Santa Catalina. Our arrival was in the later afternoon, siesta-time and everything was closed up tight as a drum. 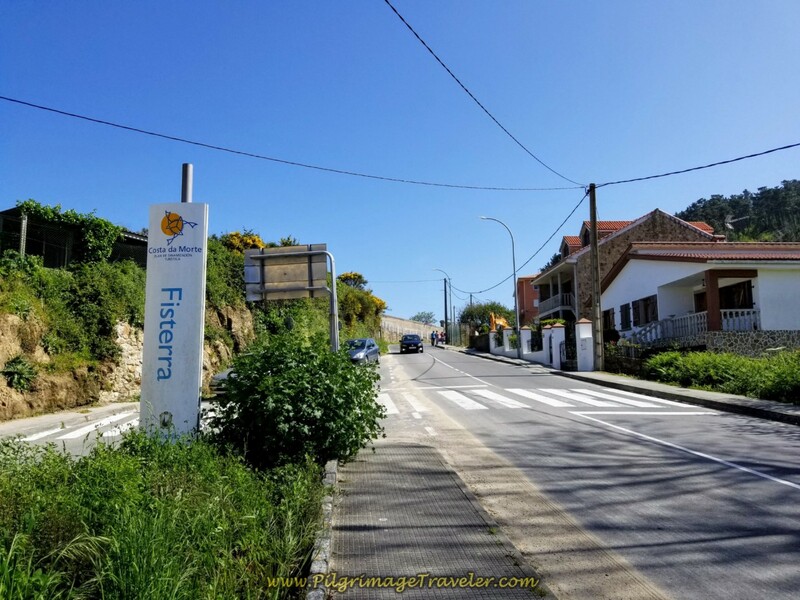 After 150 meters on the Rúa Santa Catalina, come to another T-intersection, and turn right again onto the Rúa Federico Ávila. In 200 meters more, the Camino meets the AC-445 once again, and goes to the left at a small roundabout. This is your final turn, as the AC-445 is a straight shot to the Cape, for the last 3.12 kilometers to the 0.0 kilometer marker! 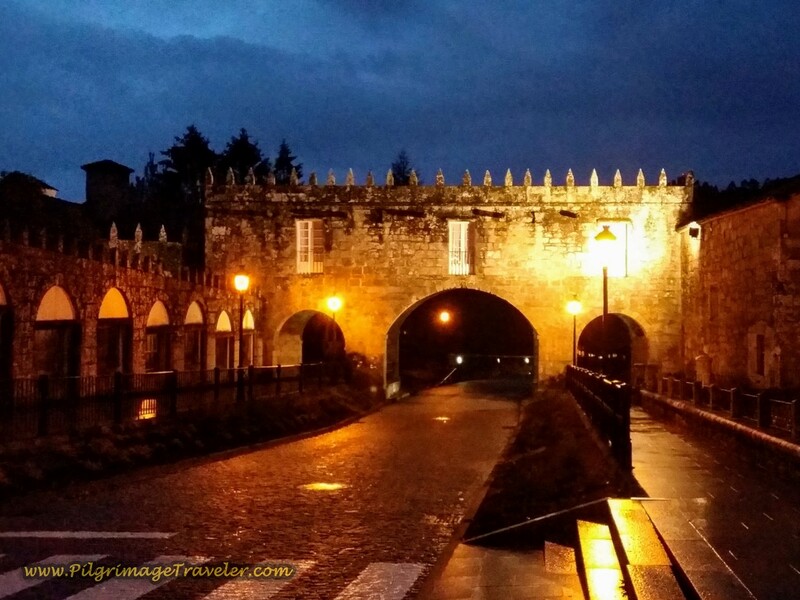 Just after the roundabout, we spied our Hotel Àncora, right along the Camino. I felt lucky to have a place so close to the Way. We checked-in, cleaned up and rested before the final trek to Land's End. After leaving our hotel, onward we went for the long trek up the hill. In about 400 meters from the beginning of the AC-445, at the roundabout, the sign below identifies that we were entering the Costa da Morte, or "Coast of Death." Finisterre Sign Announcing the "Costa da Morte"
Another 150 meters later the Iglesia de Santa María das Aeras rises above you. I have never been lucky enough to arrive here when the 12th century church is open. Click on the link to read more about it. We milled about the grounds for awhile, then eager to get to our final destination, we moved onward. Just past the church, on the right side of the road is a nice picnic area and the 2.5 kilometer waymark. Oh so close! 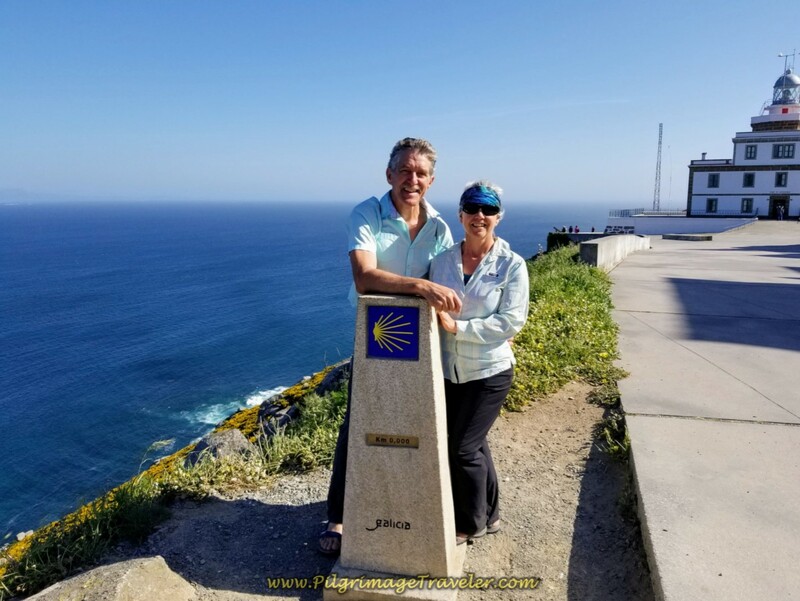 2.5 Kilometer Waymark ~ Oh So Close to Land's End! When the sidewalk ends at the picnic area, a nice, improved path runs along the side of the AC-445. This is better than in prior years when pilgrimage walkers had to share the shoulder with the oncoming traffic. 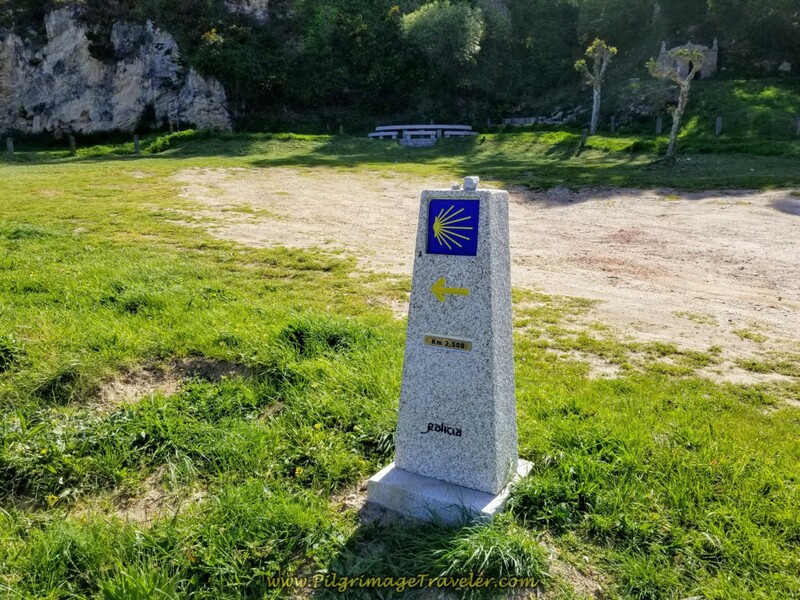 650 meters from the church is a well-signposted road turning to the right to visit the legendary ruined site of the Ermida de San Guillerme. This "pagan" place, built in the 8th century, and destroyed in the 17th by the French, is perhaps a place where the Christianization of ancient Celtic fertility rites were performed. 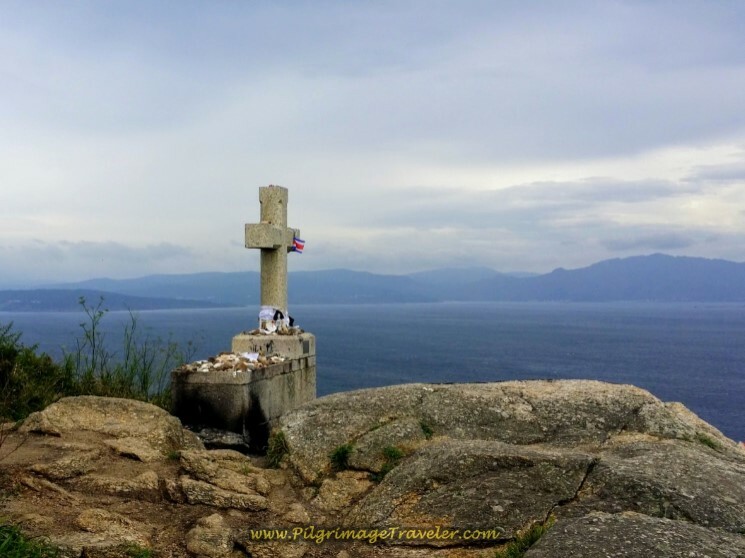 Whether or not this legend is true, the photos from the place (Click on the link) show fantastic views of Cape Finisterre and over the water to the "Mt Olympus" of Galicia, Monte Pindo. Apparently if you climb to this site, you will be able to walk down to the lighthouse from the ridge. It is longer, but perhaps a more dramatic way to the cape. Although we knew about this option, we chose not to take it. Another reason to come back? 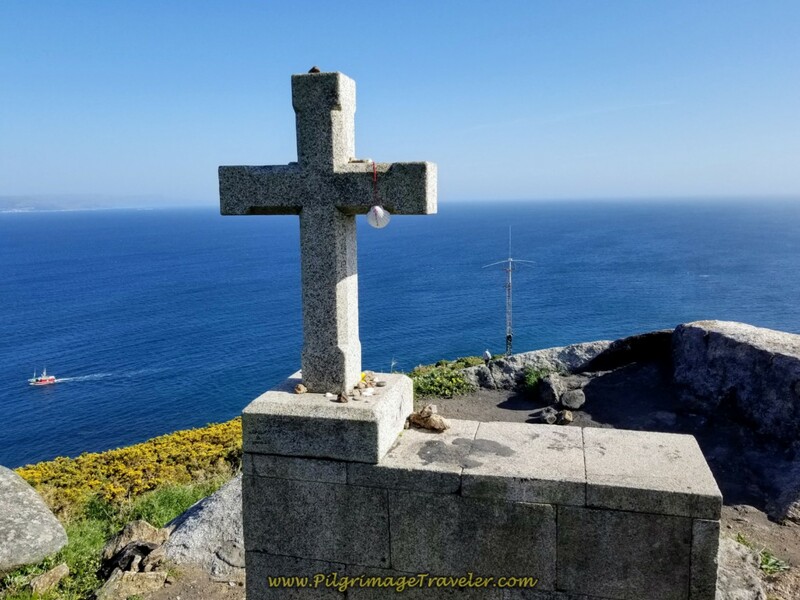 As you round the Punta de Cabanas, about 250 meters later, you encounter the very famous pilgrim statue on your way to Cabo Fisterra. Absolutely everyone takes a photo here. You are now entering the most dramatic coastline on the walk to the Cape! 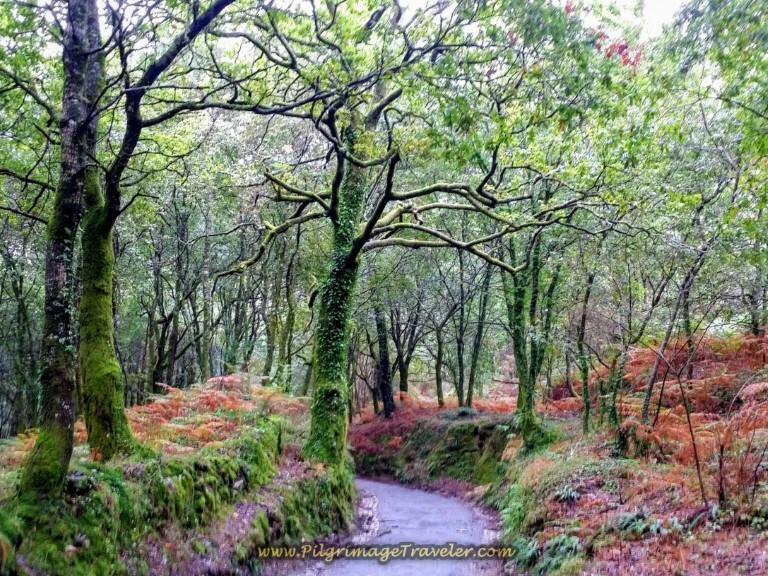 I believe that every pilgrimage traveler must walk this route first, as it does take your breath away! You can barely make out the outline of the lighthouse ahead. The first glimpse of it at the end of the Cape was a much anticipated sight! 350 meters later, we passed the 1.253 kilometer marker! This marker is by the entrance to the Finisterre cemetery. I started to feel the first stirrings of the excitement that all pilgrims feel when they know they are getting very close! 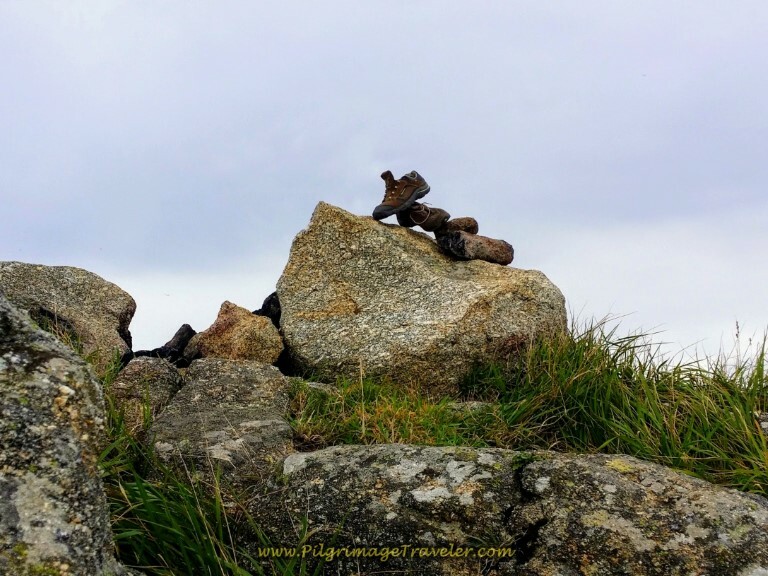 As Christine Valters Paintner reminds us in the quote at the beginning, as modern pilgrims, we are indeed one of many, as we melt into the archetypical experience of our "arrival." 800 meters ahead, when you can see a parking lot, you just feel that you are almost there! The kilometer marker by the lot says 0.356. 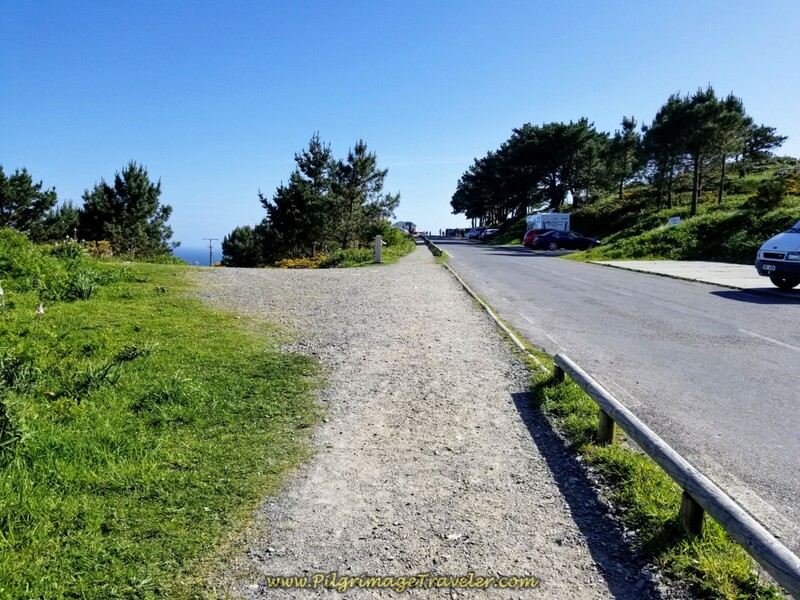 Of course, as you enter into the final steps toward the extreme end of the Cabo Fisterra, where the road ends and a pedestrian walkway begins, you find this cruceiro greeting you. It is as if the cross exclaims, "Pilgrim, you are near your journey's end." As you walk several meters more along the pedestrian walkway, past tourist shops and restrooms, the Hotel O Semaforo, perched on the high rock outcroppings invites you onward. One day, perhaps we will splurge to stay here. I imagine you would have to book months ahead to stay in this place. 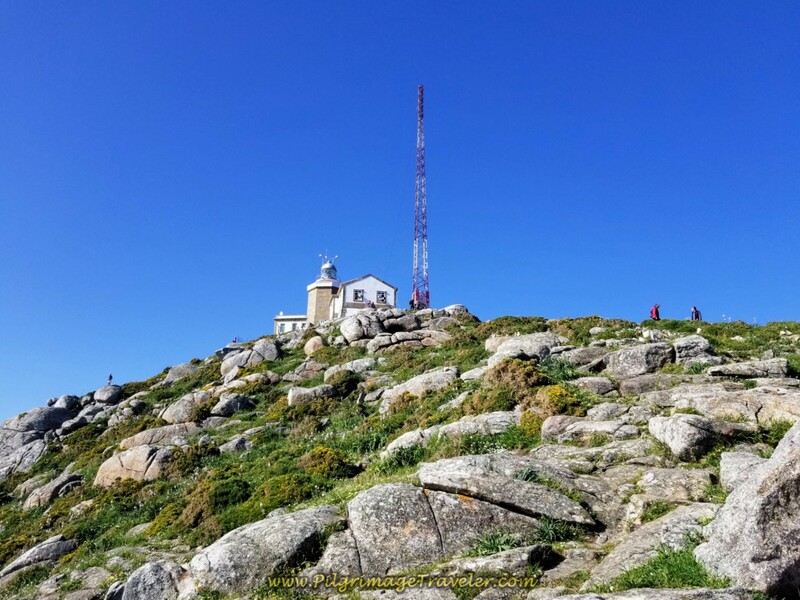 It is a wild and exposed place, here on Cape Finisterre, and we were graced with extraordinary clear weather. As you stroll towards the lighthouse building, you finally see the zero kilometer marker by the hotel. Here is Rich and I, finally here, with huge smiles on our faces. Here is where I turned off the GPS at last. 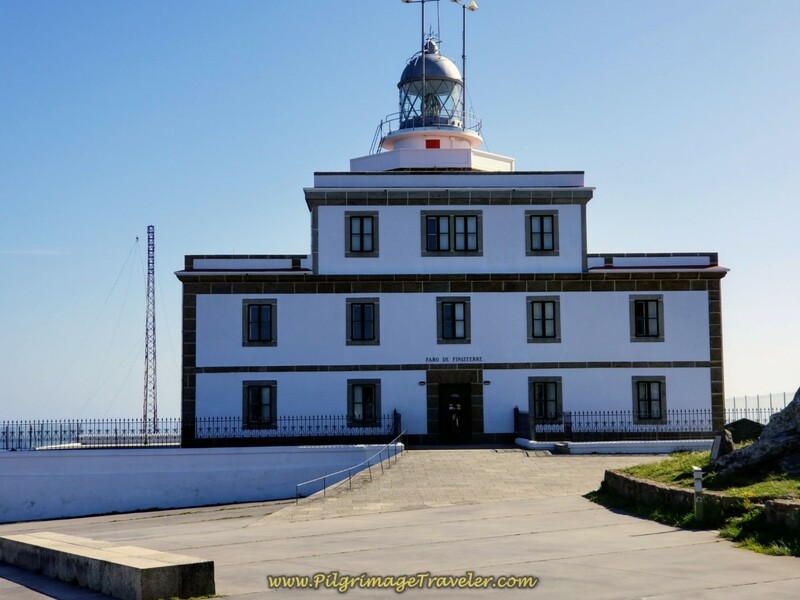 The entrance to the lighthouse building is shown below, and it contains a nice museum. 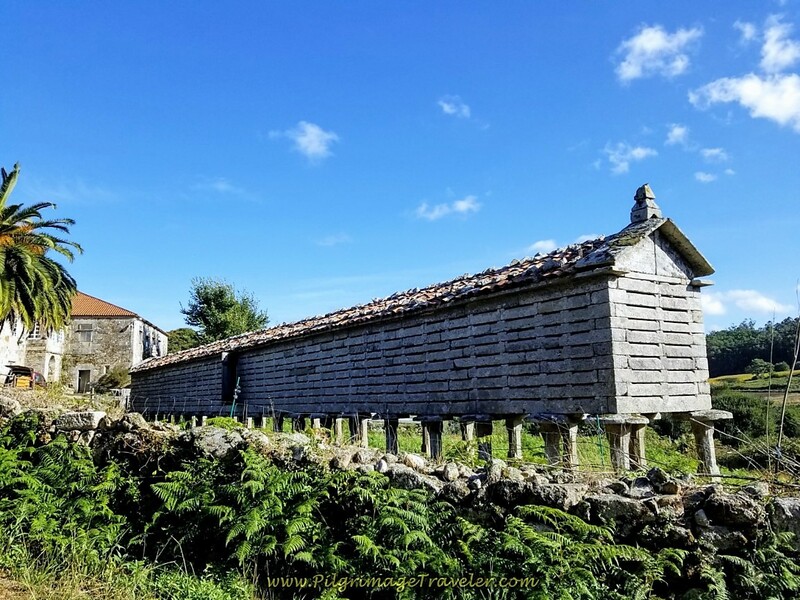 You can also get your Santiago to Finisterre Compostela in this building, called the Finisterrana. Be sure you have your credential when you walk here, if you desire this extra Compostela. 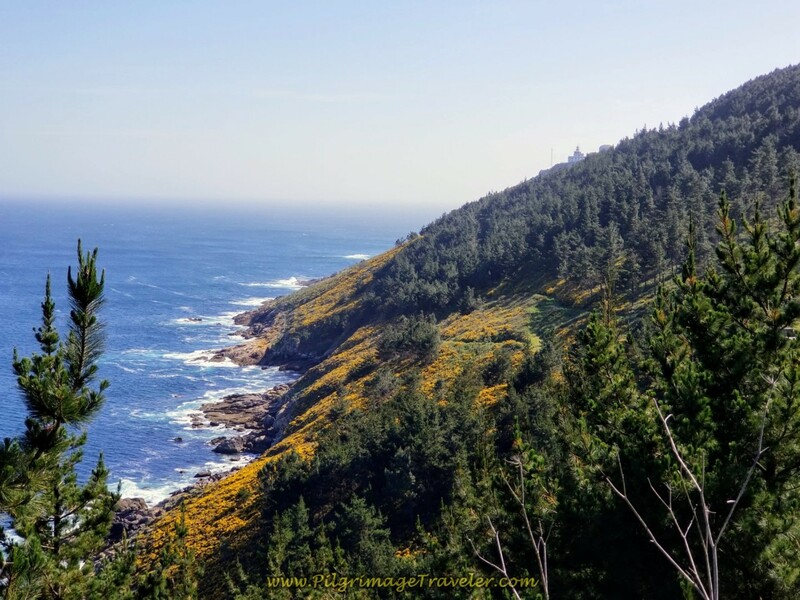 We walked past the lighthouse, and down the hill about halfway, toward the seacoast. It is quite a dramatic drop to the sea. It is easy to see why a storm could quickly turn this place into a Coast of Death. We sat here for a long while, mesmerized by the crashing waves against the rocks, contemplating the infinity of the journey. If ever there is a place where you can be "fully present to life," this is the place! We sat for a long time, celebrating with wine and cheese. While we had near perfect weather, a cloudless sky does not create a dramatic sunset, therefore there are no dramatic sunset photos from our Cross to the Cape journey. 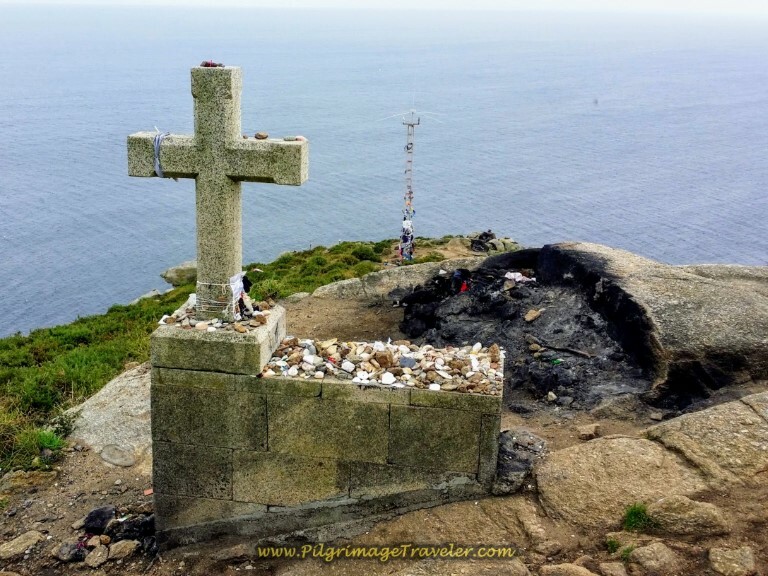 As I discussed in the introductory article for the Camino Finisterre, it is now illegal for pilgrims to leave their mark on this landscape, like burning their clothes and boots, building any type of monument, or leaving their scallop shells and clothing on the towers and crosses. Too many people have left too many scars, too many ornaments and rock piles and Spanish firemen have had to put out too many fires, so leaving your mark here will endanger us all. While I am neither for nor against this phenomenon of the past and have never participated in it myself, my heart experienced a loss when I arrived here. I had never even thought about the problem until then. I was astonished to see an entirely clean landscape, as I depicted in my photos above, when I expected to see the black scars of fires, and pilgrim's clothing flapping in the wind! I had to spend some moments grieving this unexpected loss. The last time I was here, all these momentos and rituals felt very reverent to me! They were cleansing rituals! Call me a romanticist, which I will never deny, but grieve I did! Alas, I am also a bit of a pragmatist, so I drank more wine and accepted that these rituals were barbaric, perhaps, and unsafe. I focused on the amazing and natural beauty of the landscape instead. 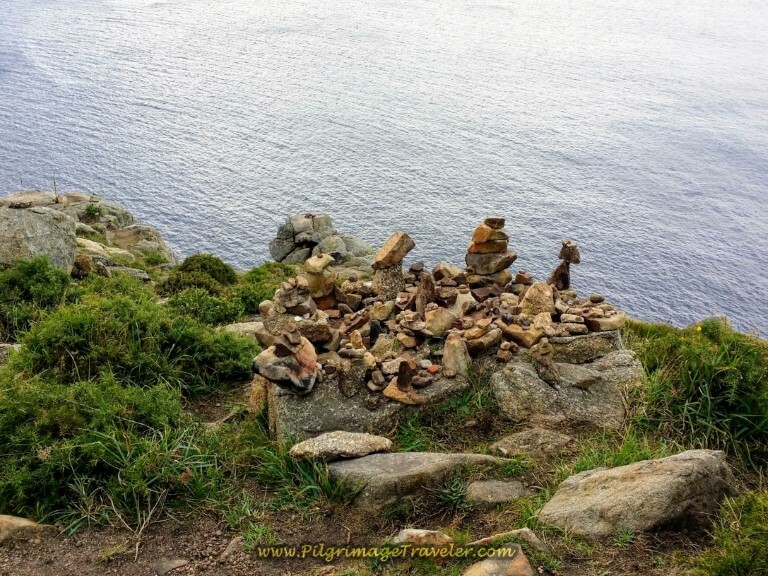 "According to the Confraternity of St. James, "Pilgrims Guide to Finisterre," published in Jan 2009, this bronze sculpture is in memory of a pilgrim who drowned here in the 1990's. I can't verify this. Most web references just say it is to commemorate pilgrims who journey here. 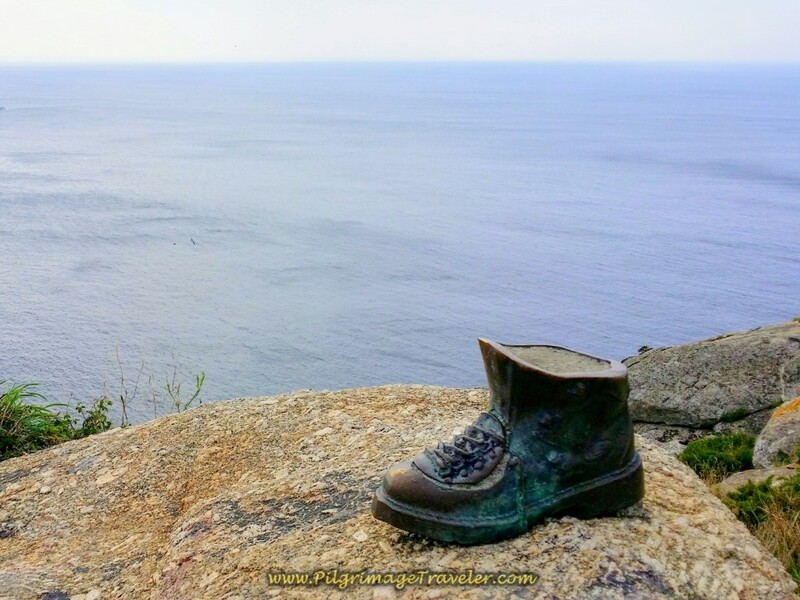 Whatever the case may be for the bronze boot, it is a lovely addition to the coast and will aid your reflection on the miles you have traveled to be here. I took a moment then to reflect on my own pilgrimage travels. I took my time, trying to capture this moment in a photo as well." The missing sculpture was a real loss for me! Where did it go? I cannot find the answer. If you know the answer, please comment below and inform us all. 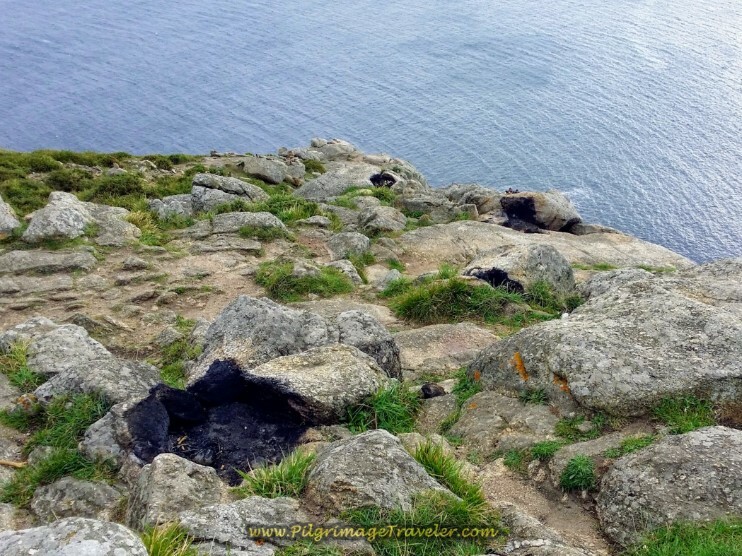 "Scattered over the rocky ledges on the cliff tumbling into the sea for several hundred feet are the remains of the many fires where pilgrims have burnt their boots and their clothes. 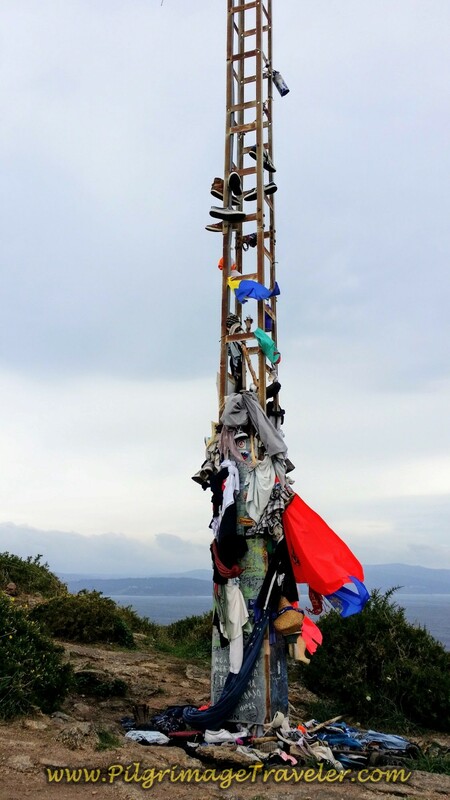 This is a symbolic gesture that represents their desire to rid themselves of all they no longer need. This ritual is usually done at sunset. My first desire, upon seeing this cliff, was to run down to the edge of the sea. Not sure why I had that desire, but I ended up only going about halfway. It was a long way down and I didn't want to have to climb back up! I did not build my own cleansing fire. I was not there at sunset and I did not feel the need. I am not sure why of this either. I just noticed my energy and the energy of all those who had done so. This was certainly a reverent and special place." Take a journey back with me in time, to the scarred and scattered landscape. 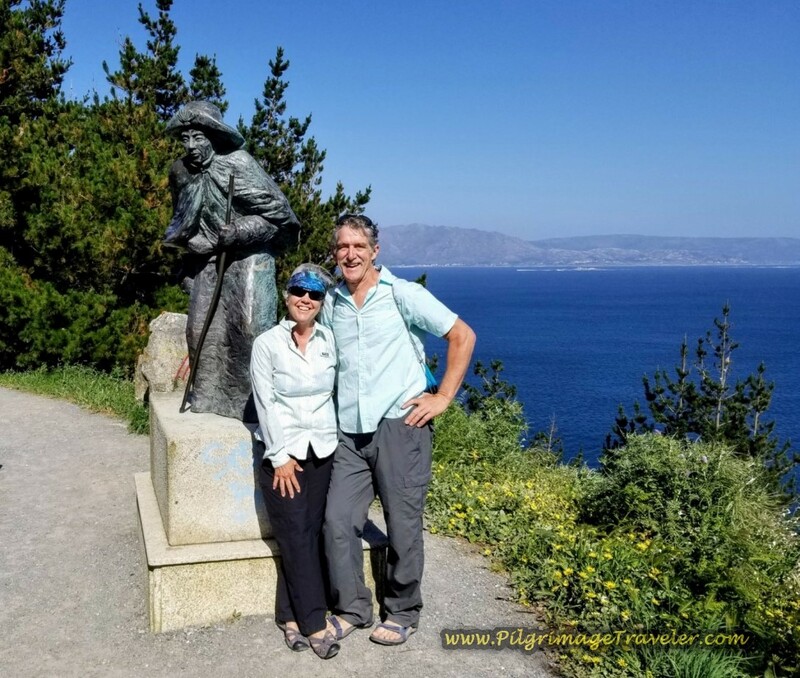 Feel the energy of all the pilgrim's who have been here, left their mark, and also feel the energy of those to come who will only revel in the natural beauty and the lore of this sacred place. 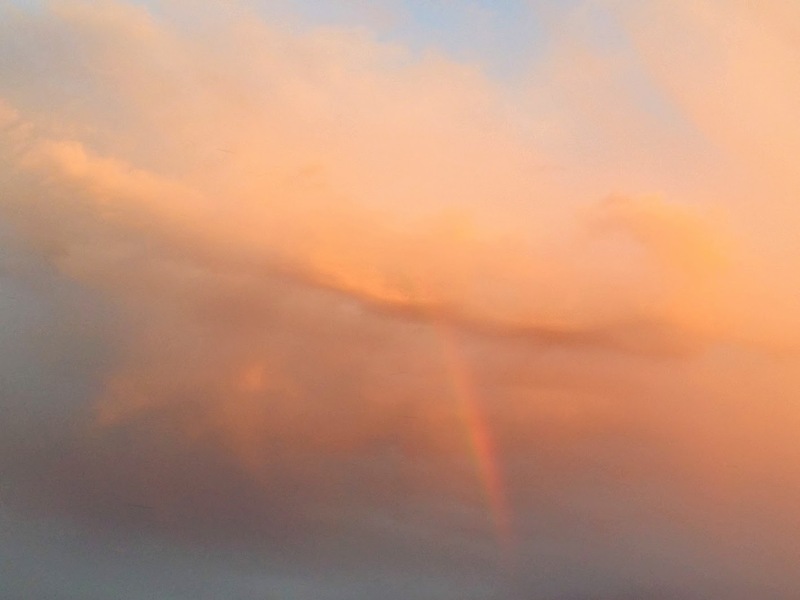 And the final tribute to all pilgrims is a sky filled with promise. 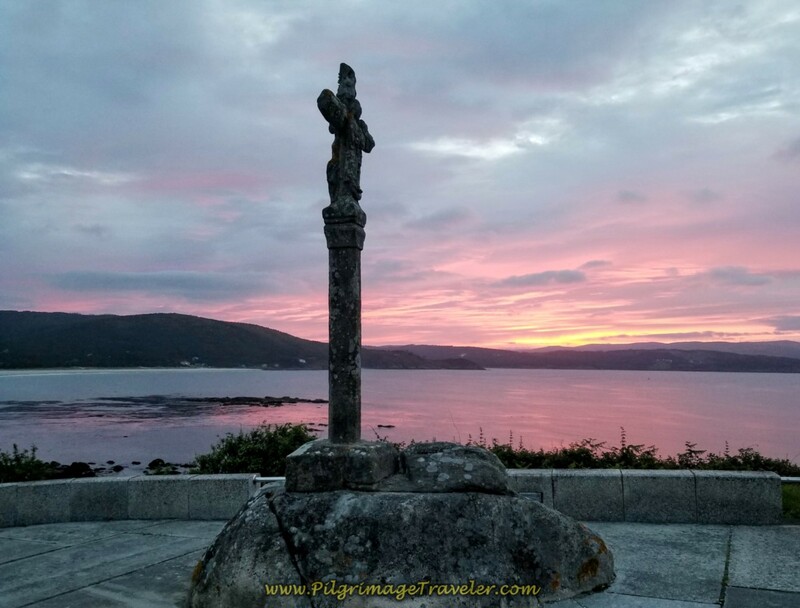 I took this photo the first evening I spent in Finisterre. It seems appropriate that I saw it here, where the journey ends and where the journey begins. Can you see it? 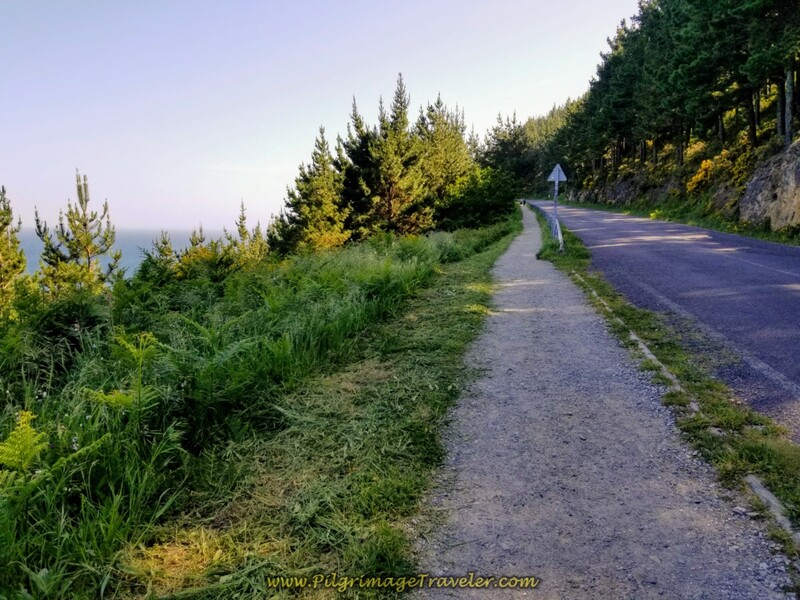 The inward journey always accompanies the outer journey on your Camino. 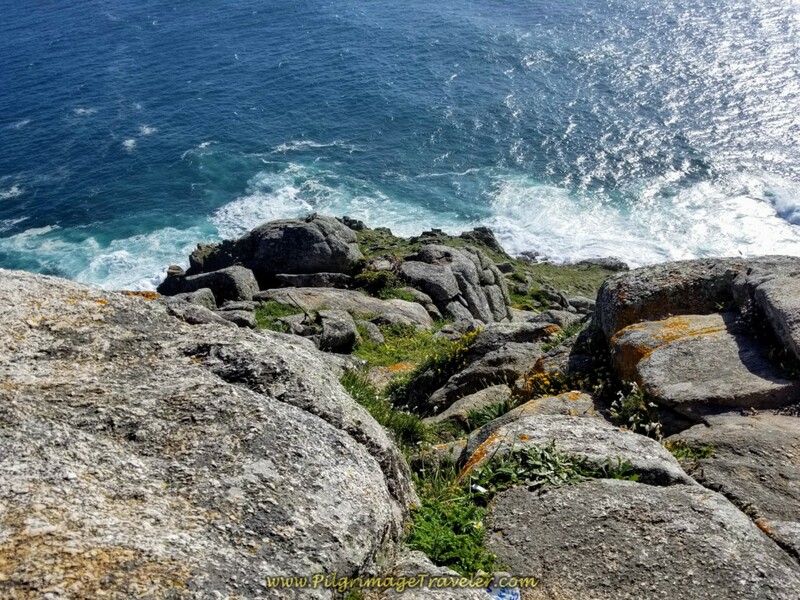 May your own journey from the Cross to the Cape be filled with special moments of joy as you struggle to understand what your "arrival" here to this place means for you. 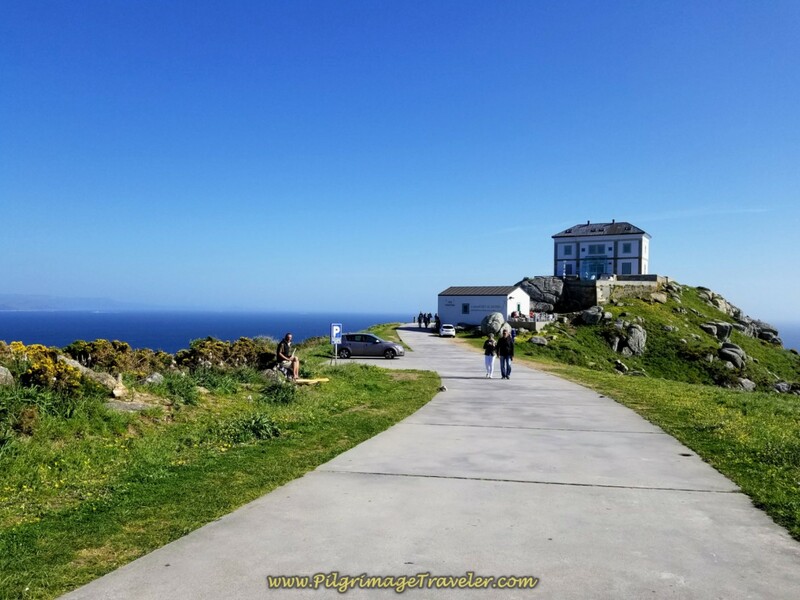 Finisterre may be Land's End, a place where the journey ends, but it is also where the journey begins.